Plus, this mung bean recipe is plant based, gluten free and (most importantly) quite relishing. What’s not to love? What are Mung Beans? What are the Benefits of Mung Beans? If you follow Girl Heart Food, you probably know that I love using all sorts of beans and lentils; they’re always stocked in our pantry, whether dried or canned (preferably the unsalted variety). Searching through the grocery store a few days ago, I decided to check out the various types of dried beans and legumes (’cause I’m super exciting like that, lol). Anywho, I happened across mung beans, like one does 😉 I knew I had to give ’em a try. Why? Well, I was super impressed with how nutritious these are. Mung beans are a type of legume and are loaded with fibre (16 grams per 1/2 a cup!! ), potassium and protein. Plus, I got a HUGE bag for practically nothing. Side note—>isn’t that green colour so preeeeeeetty? Do you Soak Mung Beans Before Cooking? How to Soak Mung Beans? Yes, I prefer to soak mung beans overnight before cooking the next day. Like with most dried beans or legumes it really helps the cooking process if they are soaked. To soak mung beans, rinse under cold water, place in a large bowl, cover with cold water (about 2-3 times the volume of mung beans) and soak overnight in fridge. The next day, drain water and proceed with recipe. The mung beans will plump up a little after soaking. 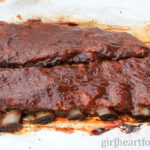 You may be thinking, ‘Dawn…slow cooker in spring?’ Yes! We use our slow cooker year ’round in our home because it’s too darn convenient. 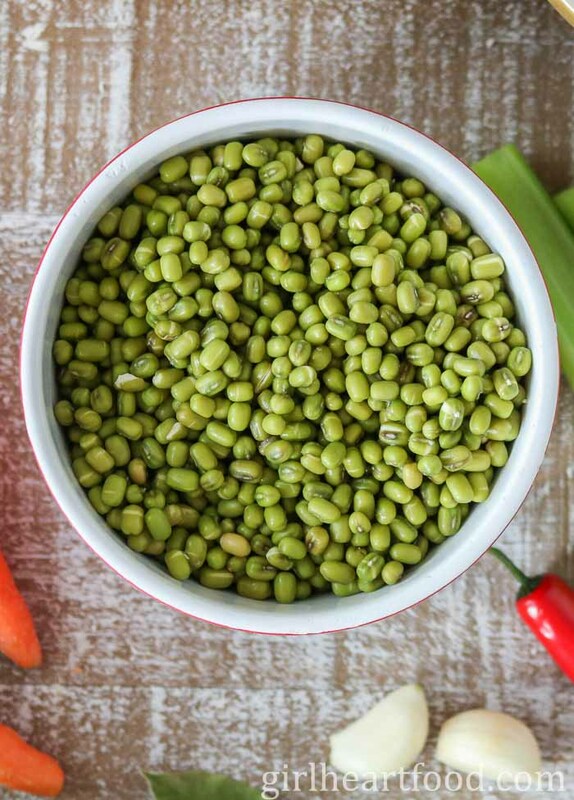 So, break yours out and whip up this super easy mung bean recipe! 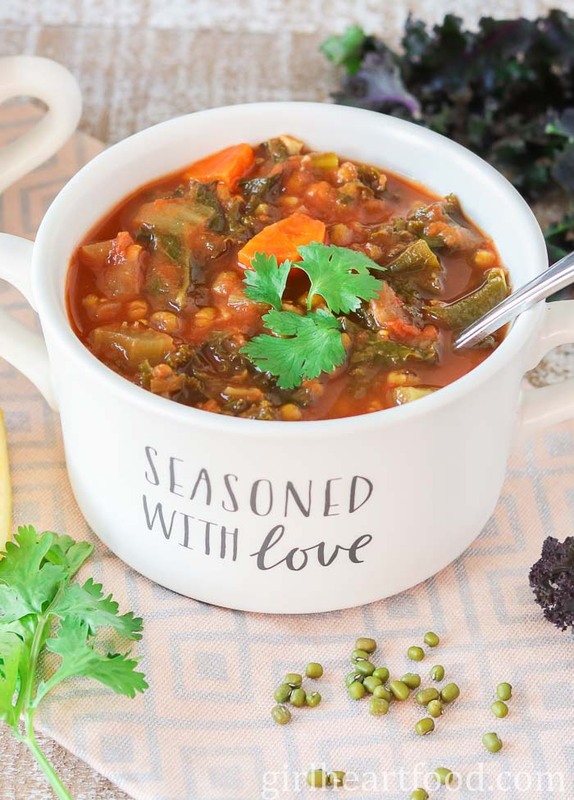 The mung beans cook beautifully with the other aromatic and tasty ingredients; seven hours later you’ll be left with a super satisfying, hearty legume and vegetable soup. Place soaked mung beans in a slow cooker along with remainder of ingredients for this mung bean soup (with the exception of cilantro and lemon). Portion and garnish with cilantro and lemon. Can I Freeze Mung Bean Soup? Yes you can (there’s some on our freezer as we speak)! Portion cooled mung bean soup into vacuum sealed bags, seal and lay flat to freeze. Alternatively, place in freezer safe bags or sealed containers. When you are ready to enjoy, simply thaw and reheat on stovetop. 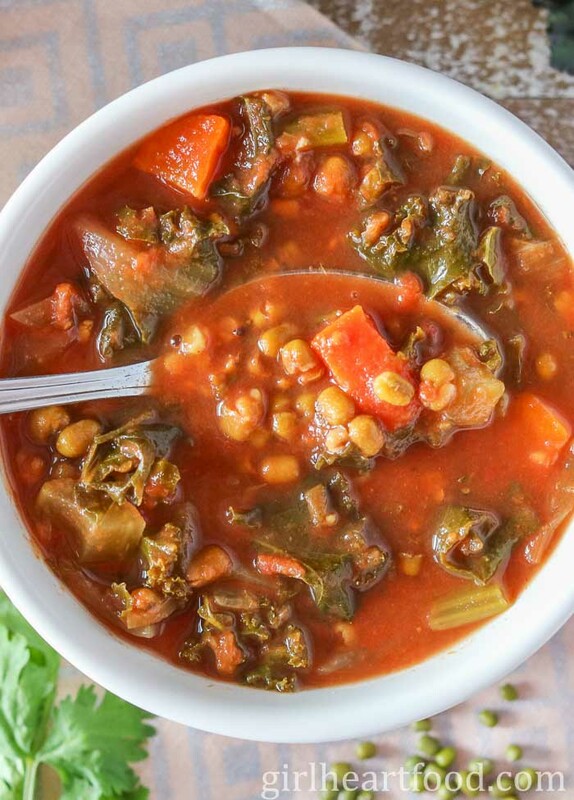 Kale is used in this mung bean soup, but spinach (or a combo of both) would work lovely. If you aren’t a fan of cilantro, you could use parsley or omit. Both are fragrant (cilantro more so, in my opinion) and also adds an extra punch of nutrition. A squeeze of lemon squeezed upon serving really brightens this soup and adds a lil’ somthin’ somethin’. Highly recommended! Want to omit the chili? Go for it! I love the spicy kick it adds, but you do what makes you happy! ‘Whole’ tomatoes in a can are recommended. Crush ’em with a potato masher or blitz with an immersion blender. Hope you love this mung bean recipe and give ’em a try! 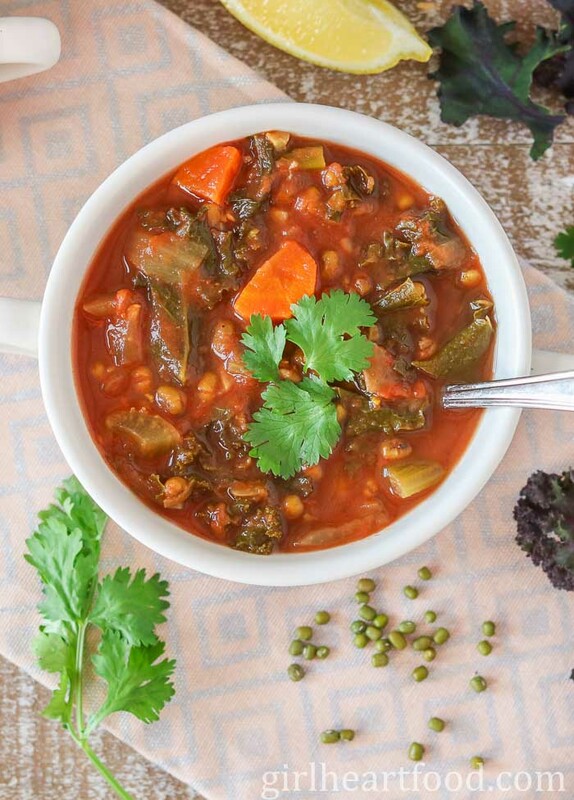 This clean eating Mung Bean Soup is loaded with kale, carrot, celery and, of course, mung beans. There's a welcomed spicy kick from lots of fresh ginger and chili. Plus, this mung bean recipe is ultra easy to prepare and totally belly warming! Soak beans overnight in a bowl of cold water. Place in fridge (ensure they are covered well in water). Drain the next day. In a slow cooker on low add all ingredients (except lemon wedge and cilantro) and stir to combine. Cook 6-7 hours. Discard bay leaf. Garnish with cilantro (if using). Serve with lemon wedge squeezed over top. Enjoy! If you aren't a fan of cilantro, you could use parsley or omit. Both are fragrant (cilantro more so, in my opinion) and also adds an extra punch of nutrition. A squeeze of lemon upon serving really brightens this soup and adds a lil' somthin' somethin'. Highly recommended! 'Whole' tomatoes in a can are recommended. Crush 'em with a potato masher or blitz with an immersion blender. I love when a new ingredient pops up and really catches my eye– MUNG BEANS! Why have I never cooked with mung beans at home? I often buy a quinoa salad that has herbs, cucumbers and mung beans tossed throughout and I love it. Now you’ve given me the motivation and confidence to try cooking with mung beans myself. Thanks, Dawn! I love it when clean eating means chowing down on something so hearty and with so many flavors I love! This is a must try! Dawn, I can never get enough of your soups! And this mung bean soup looks so hearty and delicious! Love it! I love hearty bean soups, but I’ve never tried mung beans! I’ll have to give this one a try. I always enjoy kale in soup, and the ginger must add a nice flavour to this one! Hope you love it! It’s a hearty and delish one for sure 🙂 Thanks Leanne! What a vibrant and healthy soup, Dawn! I love the suggestion of squeezing lemon into it, it does brighten up so many dishes! I’ve never cooked with mung beans, but now you have me on the lookout for them>. Thanks! I’ve got to give this soup and mainly mung beans a try! They look so pretty ( I love that you get excited about beans:) Pinned! Haha…I really do 🙂 Thank you Milena! Hope you love ’em! I’ve never used mung beans, but now I’m going to have to search for them the next time I go shopping! This soup looks delicious and healthy too! Haha! As a fellow food blogger, I totally appreciate the fact that you just happened onto a huge bag of mung beans. 🙂 But, hey, it looks like you put those beans to good use. This soup sounds quite delicious! The ginger and chili are a great flavor combo, and I’m thinking this soup would be great for easy weekday lunches. Yum! Lol, right 😉 ?? Thanks David! Have a wonderful week! I have never had mung beans Dawn, but I’m so excited to try them. This soup is screaming to be added to our soup menu. So healthy, which is just what we need! Just looking at these photos makes my stomach earning for a big bowl of it! Such a comforting, plus packed with protein, for a filling meal. 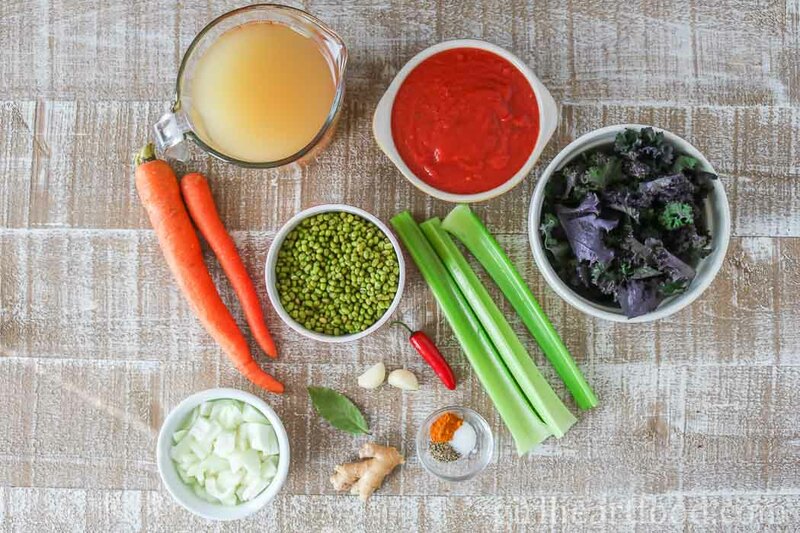 I feel healthy just looking at the ingredients for this gorgeous soup :). I LOVE soup so much and even thought it’s warming up here, I’m going to try this one soon. Have a great week, Dawn! Yay! Happy to hear that! Thank you Kelsie 🙂 Hope you love it! Have a great week too.